Publisher/Editor, Observer Group Newspapers of Southern Ca. Inc. 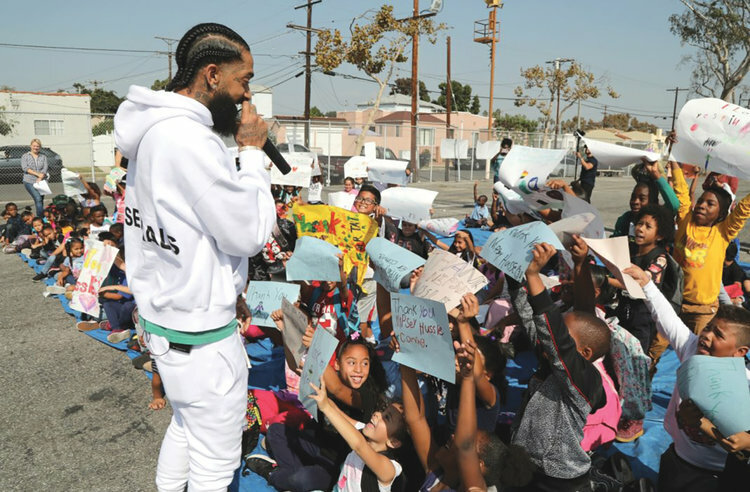 I spent the last 10 years watching Nipsey grow, not just through his music but through the relationships that were built as a result of our weekly local newspaper delivery, in and around South Central Los Angeles. From watching him and his brother Blacc Sam sell mixtapes, t-shirts and socks from a table on the street corner of Slauson and Crenshaw, to being at the grand reopening of The Marathon Clothing Store. Nipsey, Sam, and the team embraced our publication in advertising with us and having our paper on display for their customers. Nipsey was a powerhouse in west coast hip hop — and as authentic as his lyrics are, is as equally as brilliant as his delivery. To get what Nipsey meant to so many, you’d have to try and understand what it means to grow up under privileged, forgotten, and disregarded. What he stood for, what he was in the midst of becoming, for his community and beyond transcended the music. Nipsey was hard to miss standing at 6’3’ tall, long hair and a thick beard, he had presence. When you spoke to him, he looked you directly in the eye, shook your hand and gave you the respect of his careful attention. Every fan mattered to him. Even down to expressing his appreciation for my father, an even bigger fan than me. Watching him grow as a black man in a system purely designed for his failure and seeing him come out of it, is a powerful example of the human will. He was relatable, in a space where he had every reason to leave the streets behind, run and never look back. He did the opposite. From the very beginning he had a spirit of entrepreneurship. He regularly discussed investments through his music, like the 2018, grand reopening of the Marathon Clothing Store. A smart store designed to infuse technology and fashion, positioned directly on the corner, not far from where he once sold mixtapes and his brother sold t-shirts and socks. His Vector 90 space is serving as a conduit to connect Crenshaw to Silicon Valley by offering tech mentorship, shared creative space, and cultural connections and support. He also kept philanthropy at the forefront of his radar. In a partnership with Puma, he secured a $10,000 donation and the painting of the basketball courts at the local 59th Street Elementary School. He also fed and gave to the community homeless regularly. He even had plans to meet with the Los Angeles Chief of Police this week to discuss gang violence. This was a man on a mission — a man who knew that real growth and real change starts from within. A man who knew that if you are blessed enough to stand up, you must turn around and stretch a hand for another. When it comes to the music, Nipsey forged trails that made him a household name. Upon the release of the Crenshaw mixtape, he offered his album on pre-sale for $100 each, a move that shocked fans of the genre across the nation and garnered support from Jay-Z, who bought 100 copies. Following it up with his official debut album, Victory Lap, a brilliant ode to California up-tempos and smooth lyrics, earning him a Grammy nomination. Nipsey released 13 mixtapes throughout his career. Each one showing progressive talent and skill. His music was authentic. He wasn’t just talking about living the street life. He was motivating. He was influencing change and looking to build an entire community. Inspiration through his music flowed like water. Some of my favorites include “Hussle and Motivate,” “Victory Lap,” “Grinding All My Life” and “Down As a Great,” just to name a few. His music seems to always contain parallels to the grind, leveling up, doing better for yourself, ownership and wanting more. I can particularly relate to the lyrics about carrying the weight of family and friends and with getting comfortable with being uncomfortable. I hear his music differently now in songs like “Racks In The Middle,” where he eerily references death. It becomes difficult not to focus on how much good he could have done if he were still with us, how many lives were inspired by his work, and how many more could have been changed. He challenged every stereotype to forget what is believed about street life and dug deeper. He was educated, hardworking, hands on and didn’t cut corners. Nipsey understood on a deeper level what the streets and the culture needed. He wanted to leave South Central better than what was given to him. And we believe he has done just that. Here at The Observer, we honor Nipsey and pray for the family and community, and the legacy of his success will far out last the pain of his loss.